a sleigh ride down to the valley and was at several of the relatives. It was night when we got home. I helped get the supper work done and knit in the evening. We sat up rather late for Kate Pentzer came on the evening train and it was late. 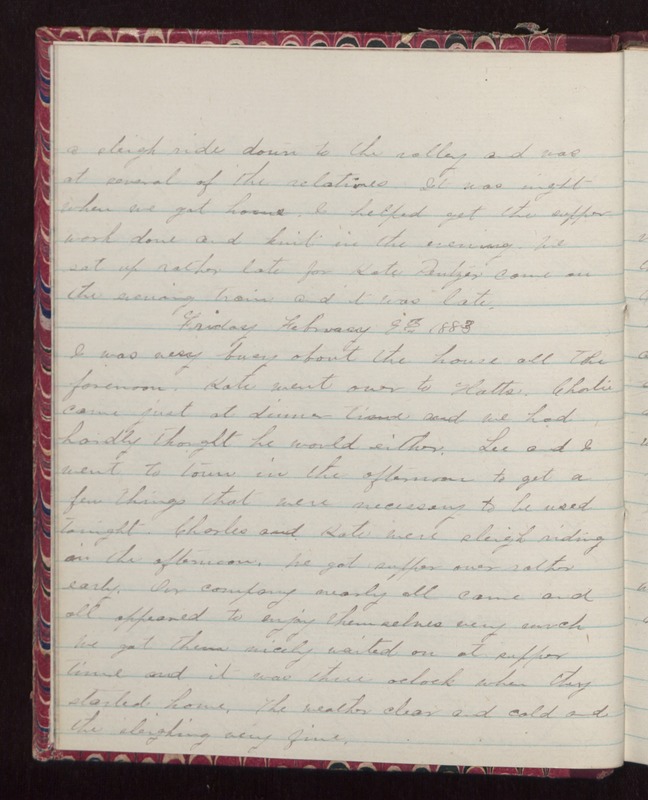 Friday February 9th 1883 I was very busy about the house all the forenoon. Kate went over to Hatts. Charlie came just at dinner time and we had hardly thought he would either. Lee and I went to town in the afternoon to get a few things that were necessary to be used tonight. Charles and Kate were sleigh riding in the afternoon. We got supper over rather early. Our company nearly all came and all appeared to enjoy themselves very much We got them nicely waited on at supper time and it was three oclock when they started home. The weather clear and cold and the sleighing very fine.